Study of America's "Funny Business"
"Funny is funny. No matter what language. No matter who says it." Ms. Marie may indeed be right-- much like that memorable scene in Reality Bites when aspiring filmmaker Winona Ryder is asked to define "irony," then struggles and replies, "I know it when I see it," the same is essentially true of comedy. Hard to pinpoint and even harder for it to be successful as we all learned from witnessing the crash and burn of our favorite comics as they mug too much in the pursuit of a laugh (Mike Meyers in The Love Guru, Steve Martin in The Pink Panther) but we definitely know it when we see it. A documentary about comedy in the United States-- whether it's silent comedy, slapstick, stand-up, situation comedy, variety show format, reality television, or satire-- is all explored in this terrific six episode documentary from Michael Kantor who managed to put together the equally brilliant six-part piece on Broadway: The American Musical back in 2004. While he won't be giving Ken Burns a run for his money anytime soon focusing on entertainment and relying mostly on interviews and rare archived footage rather than government documents-- it's a damn sight more entertaining than some of the undeniably brilliant, yet intellectually exhausting Burns documentaries. As Kantor quotes E.B. White in the introduction to Rhino Entertainment's beautifully boxed three disc set, "Analyzing humor is like dissecting a frog. Few people are interested, and the frog dies of it." While I definitely disagree that few people are interested-- there is fear when one breaks down the funny that the spell will be broken, the illusion never the same, as though we were let behind the curtain at Oz and then told we must return to Kansas and forget everything we saw when we were there. Yet, Make 'Em Laugh is more a celebration of humor in this country or more precisely, one that's nearly exclusively focused on the twentieth century--save for a brief twenty-first century comedy health check-- so to speak as the interviewees discuss modern marvels like The Daily Show, The Colbert Report, Real Time with Bill Maher, and the films of Judd Apatow before ultimately admitting that in a sense humor as we knew it is evolving, as reality television and YouTube overtake the situation comedy (already growing scarce) and the business goes through another incarnation. Although all six parts recently aired on PBS during the past month, Rhino loads the discs with bonus content that goes further in-depth with some of the interviewees as many viewers-- including this one-- found themselves even more entranced by the astute observations of the professionals working in the trade than by the "experts" or narration by Amy Sedaris (whose involvement I applaud as-- essentially-- save for a few big standouts, comedy has overwhelmingly been a male dominated industry). The series is broken up into the following episode titles: 1) "Would Ya Hit A Guy With Glasses? Nerds, Jerks & Oddballs;" 2) "Honey I'm Home! Breadwinners and Homemakers;" 3) "Slip On a Banana Peel-- "The Knockabouts;" 4) "When I'm Bad, I'm Better-- The Groundbreakers;" 5) "Never Give A Sucker An Even Break-- The Wiseguys;" 6) "Sock It To Me?-- Satire and Parody." 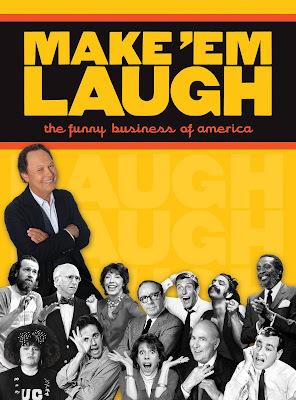 Featuring astute observations by comics and historians alike, Make 'Em Laugh is a comedy lover's dream, unearthing some rare and classic footage of old routines by early silent pioneers like Harold Lloyd, Buster Keaton and Charlie Chaplin before moving into the realm of The Marx Brothers, Bob Hope, George Burns and Gracie Allen, Jonathan Winters, Mae West, Jerry Lewis, Bob Newhart, Mort Sahl, Lenny Bruce, W.C. Fields, Carol Burnett, Phyllis Diller, Joan Rivers, and many more. And it isn't long before we begin uncovering patterns throughout the comedic work of the decades investigated and above all the way that past comics have influenced the subsequent generations as seeing early Winters improvisational material and his joke about being from outer space (but not being able to talk about it) seemed to have a startling impact on Robin Williams and George Carlin's love of language (including those famous words you're not aloud to say on television) seems to find its way into the semantic driven jokes of Jerry Seinfeld whose made a career of playing with phrasing and reveling in linguistic gymnastics. Particularly significant, not just for its inclusion of such legends as Cheech and Chong, Laurel and Hardy, Woody Allen, Andy Kaufman, Steven Martin, The Smothers Brothers, Eddie Murphy, and many, many others-- where Make 'Em Laugh truly succeeds is in championing some forgotten or overlooked performers those of us in my generation may not be familiar with including Moms Mabley, Paul Lynde, Tom Lehrer, and others-- just like other recent PBS specials like the Mitzi Gaynor documentary-- Make 'Em Laugh finds you longing for a comprehensive set or release of some of the work of these comedy masters. Whether or not they come from outer space, as so many comics joke throughout in describing one another seems unfathomable although their skill cannot be denied even though what one person finds funny differs from person to person (as I felt myself wanting to fast forward through The Three Stooges yet relishing in every detail about The Marx Brothers). And although the special never quite manages to figure out just what it is that makes some people so incredibly funny-- the answer it seems could very well lie in the topic itself as humor in America seems to have an overwhelmingly blue-collar, pull-yourself-up, "respect me, damn it" quality about itself as host Billy Crystal notes that so many comedians suffer from intense anxiety or emotional issues. And sure enough, a recurring theme is focusing on the revenge of the nerds or those who were picked on as they chide that Woody Allen himself wasn't going to get women but because he's funny, he would succeed and Phyllis Diller began performing at thirty-seven to escape a horrific marriage, dragging five kids along from show to show and indeed the situation comedy or as Jeff Foxworthy jokes-- the idea that everyone's family is crazy-- helps us all make it through the rough times. It's distinctly American to never give up, to keep fighting and to aspire for perfection even if you're aiming inward for self-deprecation or outward as we're lucky enough to live in a society where people like Jon Stewart and Stephen Colbert can keep our leaders in check due to the first amendment. And sure enough, subtly laced underneath all the hilarious remarks and footage, the story of our country is being told, personified by those throughout who used their comedy or turned to the genre to escape ridicule as Chris Rock cleverly reveals that there's something about being picked on as a kid that makes one work harder as he's never satisfied, noticing everything, and wanting to strive for perfection so as never to get picked on again. As Rowan & Martin's Laugh-In producer George Schlatter argues, "we should treasure our comedians more than we do, because they contribute more to our society than we're aware of,"and inevitably all one needs to do to understand his view is to watch ten or twenty minutes of this roughly six hour set to realize that is precisely the case. And moreover, it's through the wide range of voices whether it's a mischievous redhead named Lucille Ball, wacky stoners like Cheech Marin and Tommy Chong, a blue-collar mother like Roseanne, the audacity of Lenny Bruce, a wild and crazy Steve Martin, a curmudgeon like Larry David, a wisecracking Bart Simpson, and countless others that help define our societal landscape just as much as who we vote for president, as evidenced when Richard M. Nixon decided to request a "sock it to me," by appearing on Rowan which he once stated helped win him the presidency. Thus, in the end, comedy-- just like baseball, apple pie, and jazz-- is America.